Isn’t it funny how smells can take you back in time? The smell of school dinners can suddenly take you back to the classroom, while one whiff of the seaside and you're back on the beach on a family day out. The Christmas season is no different. The smell of fir trees, the scent your grandmother used to wear on special occasions, it all takes you back to Christmas of days gone by. Of course what smell could be more evocative than that of something delicious baking in the oven on Christmas Eve? The smell of shortbread in particular is sure to bring back childhood memories. Who can resist those just baked buttery biscuits with a mug of warm milk, or an Irish Coffee? Shortbread has been a Christmas tradition for years and is often included in hampers given out at Christmas as presents. It is believed to have originated in Scotland where there are a variety of styles available, with most areas having their own variation on the traditional shortbread. In Scotland, shortbread is even served with champagne and wine. However, despite originating in Scotland, it is popular in many other countries, including England, Denmark, Ireland and Sweden. In Sweden it is known as Drommar, which translates as 'dreams'. The name shortbread often confuses people. 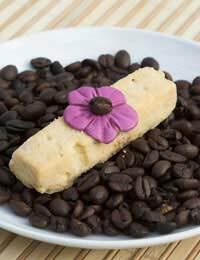 Shortbread is traditionally thought of as a cookie or biscuit yet, by it’s name, it is classified as a “bread”. It is not only the “bread” part of the name that puzzles people. Many people are baffled by the “short” aspect too. Well, let us fill you in. Apparently the word short traditionally refers to the crumbly texture of the biscuit as it is the old fashioned word for crispy or brittle. As for the bread part, amazingly it all comes down to tax! It is thought bakers in Scotland fought to stop the treat being classed as a biscuit so as to avoid paying a government tax on biscuits. Shortbreads are always a delicious Christmas treat but they’re even better when they’re homemade. They’re also surprisingly easy to make! So treat your family to a Scottish favourite this Christmas with our easy to follow recipe. Remove from oven and place on a biscuit rack to cool. TIP:To make your shortbreads even sweeter why not serve them as a desert with fresh clotted cream and strawberries. Or for the chocoholics out there, drizzle with chocolate sauce and sprinkle with hundreds and thousands. You could also add cocoa powder or vanilla extract to the mixture for a delicious twist. Try some festive mince pies to accompany your shortbread next time guests pop in.